Mamarazzi noticed that some lovely local and overseas fruits are trending now in the Pasar malam around our place apart from the usual Banana, Papaya, apples and oranges. Yup...Durian season is at its peak now. The King of Fruit is back. You can practically bump into a durian stall at every corner of the street here. 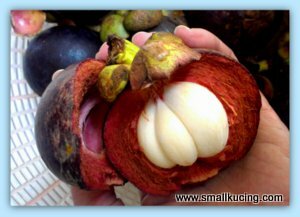 If Durian is the King of Fruit, the Mangosteen is the Queen of Fruit. But surprisingly, both type of fruit are banned from hotels, offices, cinema and trains. Not sure about in aeroplane. Who wanna try? Mangosteen is said to be "cooling". 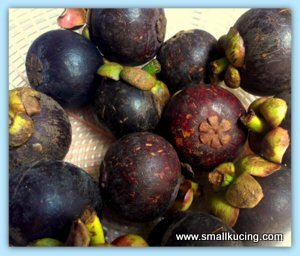 It's good to eat Mangosteen after eating durian. 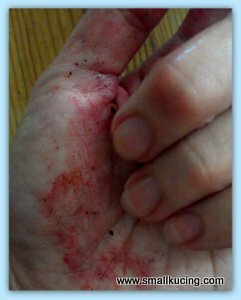 Saw some website teaching easy way to open Mangosteen. That is to press the bottom. Instead she squeeze it open. Guess the stain is the reason why it's being bann in hotels and etc. It's next to imppossible to get the stain off from all fabric. Got this big pile of Cherry for RM15. Very cheap considering the price could go up to RM7 for 100gm. Super sweet apricot. RM20 for 3 boxes. I bet Auntie Little Bird will be drooling on this as she likes Apricots. Hmm...I wonder what else Mamarazzi would get from the pasar malam next. I definitely love both durians and mangosteens! I have heard of mangosteen. It's supposed to be super healthful. Haven't seen that "King" fruit, Durian, here in California, though. 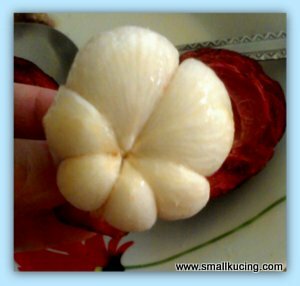 I love the way the mangosteen opens! Would like to get some! Both are closely related like both parents. i love sweet apricots too. here is very expensive! Durian buffet spread are being offered at many open air stalls all over the Klang Valley now. I see people pouring water on a durian shell and drinking it up after finished eating the durians. They say this is way it is less heaty on the body. 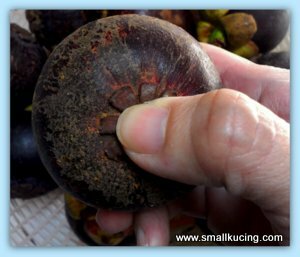 Mangosteens are in usually in season during the same time as durians, perhaps this is Mother's Nature natural remedy for durian lovers. In enclosed places like fully air-conditioned offices and hotels, the pungent durian smell can go into the air-ventilation systems and trigger off a false alarm of a gas leak. It happened in my office (an MNC) many years ago. There was panic and all staff had to evacuate to safety. We opened all the windows. Nobody knew where the 'gas' came from. Finally the HR Manager and his team found the cause of the 'gas leak' which smelled like carbon monocide poisioning. Somebody brought kampung durians to secretly enjoy in the surau! actually seldom go and concentrate on fruits at pasar malam lah.. always got other things that are more attractive to me, haha!! went to the pasar malam at happy garden yesterday, wow, i am actually impressed at the variety of things you can get there..
so many kinds of "innovative" things and "creative" food, all at far affordable price.. but too bad lah, i went there after dinner, so no "power" to buy more food..
yeah, i also noticed pasar malam now sells imported fruits now!! got apricots, strawberries, cherries and blueberries already, so upgraded haha!! the apricot RM20 for 3?? 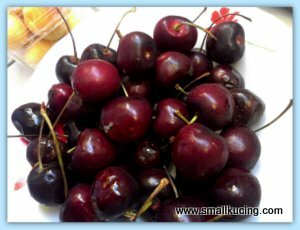 i thot those are selling around RM10 per box in supermarkets leh.. the cherries, ok lah RM15 not really cheap but reasonable lah.. supermarket also that price i think..
that day Isetan sales, cherries one box 500g only RM19.90, normal price RM29.90..
mamarazzi bought durians, mangosteen, cheeries and apricot.. never buy your favorite mangoes meh?? haha..
Ooh the apricot is cheap! Btw any plan for going durian buffet? Wah! SO nice enjoying both local & imported fruits! I also want my manggis! aiks like that also can ah? 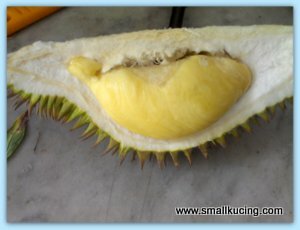 Local fruits and durians!! Nice! 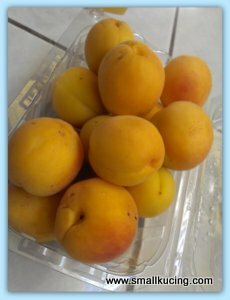 never have fresh apricot before, is it taste like plum? for Mamarazzi she said sweeter than plum. I love all the fruits you posted here! They can make me happier eating fruits than eating at wedding dinners! wah manyak kwah cheomg wor. I used to love going to pasar malams at Taman Connaught and Sri Petaling. The variety is plenty and cheap but the crowded scene always gave me headaches! I like to buy durians at Giant hypermarket when it is almost closing hours! Everything will be HARGA LELONG!!!!!! Try Tesco. Musang King when near closing can get 3 packets for RM40. That one you can bargain with the promoters. Tried that before. They will give punya. The cherry and apricots were good! Durian and mangosteens goes hand in hand, one heaty and the other cooling. Hotels don't allow durians because of the strong smell. Between both, mine is the mangosteens and those you bought looks quite nice. ya they were good. doesnt have the yellowish thingy. Silap jorr... ur Auntie Little Bird was drooling over the manggis. OMG! *PENGSAN* Looks soooo yummylicious and juicy! Fat fat flesh summore. Dies la... got to go and find it liao. Kempunaaaaannn! Just curious,are those fresh cherry local? I don't blame the hotels for banning it.. They just don't want damages. But let me tell you some people can still bring it in without the hotel authorities knowing..